Rural women of Dahod, Gujarat, have been involved in making glass beads wall hanging ornaments since long. Glass beads have been a symbol of prosperity and wealth since ancient times. Today, the artisans are still inspired by tribal arts but the ornaments are made to suit contemporary tastes. 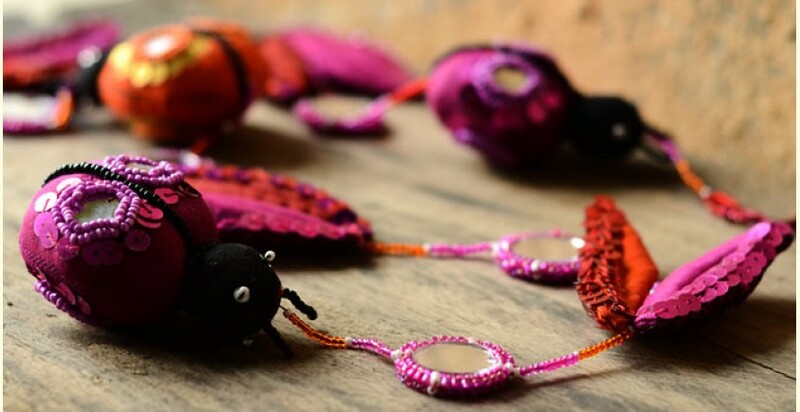 The craft traditions from rural tribes are passed from mothers to daughters and the handcrafted wall hangings are just a few of the products that the women from Dahod make for Sahaj. Sahaj is working with tribal women artisans of eastern Gujarat and provides home-based livelihood opportunities to address the issue of annual migration. It promotes sustainable development by offering better trading conditions to artisans and securing the rights of marginalized producers and workers. Socio-economic empowerment of the women through art and craft based activities secure a woman’s position in society where she becomes a role model for the future generations. Sahaj envisions an inclusive, equitable and healthy society where men and women support each other in every aspect of life and enjoy their right to realize their full potential. At the start of the partnership, 500 women find regular income through Sahaj. The joint goal is to realize Sahaj’s ambition which is to enable 5,000 tribal women in western India to earn an income through home-based activities by 2020.